Papers: 1850-1926. 13.5 linear feet. Correspondence, speeches and writings, real estate documents, reports, legislation, proclamations, court papers, photographs, and clippings. 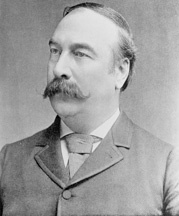 A small portion relates to Senate career, but most ralates to service in Civil War, term as governor of Washington Territory, his work for the E. Remington & Sons Arms Company after the Civil War, and personal and business matters. Gubernatorial papers mainly concern the anti-Chinese riots of 1885-1886. Finding aid. Additional Papers: Correspondence in Norman Fales Blalock letterbook, 1891-1892. Papers: 1873-1889. 1 cubic foot. Territorial governor records including general subject and correspondence files (1873-1889); militia file (1882-1887); pardons and extraditions (1884-1886); and reports and statistical files (1873-1887).